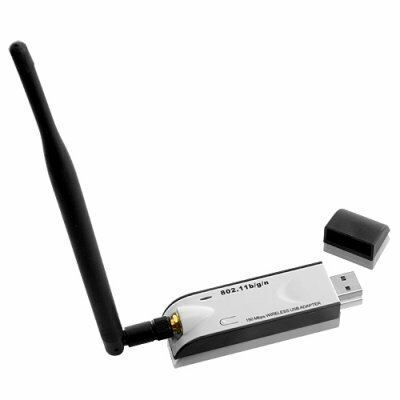 Successfully Added 802.11N High Speed Wireless USB Adapter with Antenna (200m Long Range) to your Shopping Cart. 150Mpbs High Speed Wireless USB adapter on 802.11N with fast and simple installation for instant internet access. If you're looking for the easiest way to connect to your home router or WIFI network, then check out what this amazing item has to offer. This amazing WIFI adapter also comes with an indoor range of up to 200M and an outdoor range of up to 600M, which means you can check your email on your laptop or go online through the PSP from anywhere in the apartment. Just when you thought it couldn't get better, feast your eyes on the blazing, next generation 802.11N data transfer speeds. Even though this wireless USB adapter supports the previous standards of 802.11G (54 Mbps) and 802.11B (11 Mbps), the new 802.11N standard is over 3 times as fast and provides an amazing 150 Mbps data transfer speed. The 802.11N High Speed Wireless USB Adapter with Antenna is in stock now and available for single and bulk purchases, Click "Add to Cart" now and we'll ship you a sample the very next day, brought to you from the leaders in China factory direct wholesale electronics, Chinavasion. Supports Sony PSP for online games. Just arrived and i am pleased, thx chinavasion, you have a new client!